Billy Butlin opened his first camp at Skegness in 1936. However, it is the 50s and 60s that most people think of as the heyday of Butlin's and the British holiday camp. Butlin's moved with the times in the 60s. The camps boasted a host of decidedly modern features, such as monorails and glass sided swimming pools. This postcard shows the glass sided swimming pool at Filey. Here the customers at a café are enjoying the novelty of being able to watch the bathers from an unusual viewpoint. Skiing at Butlin's! 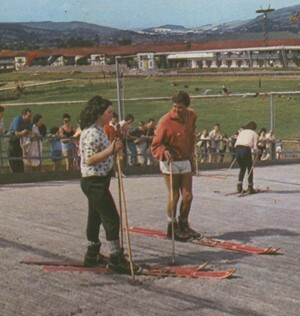 It might seem strange, but you could even go skiing at Butlin's; Minehead had this dry ski slope. Winter sports did not have the popularity that they enjoy today, for the majority of people in the UK, a holiday in Spain was adventurous. The ski slope at Butlin's would have been the nearest most people would ever get to a skiing holiday. Butlin's Bognor Regis (left) was a new addition to the Billy Butlin empire in the 60s. A long protracted negotiation with Bognor Regis Town Council finally resulted in Billy Butlin moving from a fairground close to the town centre to a fully fledged holiday camp close to the seafront. 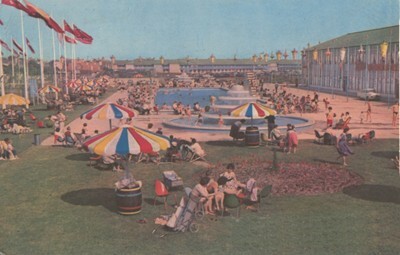 This shot of the pool (left) shows the coloured umbrellas that were part of the Butlin trade mark. 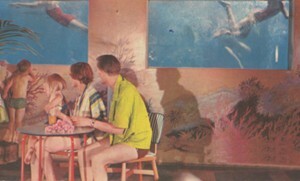 Butlin's first camp at Skegness was still going strong in the sixties. 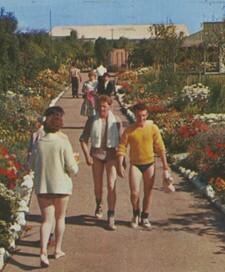 Holidaymakers enjoy the gardens at Skegness (right). A colourful garden was a very important part of a 60s holiday resort. Butlin was aware of this and made his camps into mini holiday resorts in themselves, ensuring that holidaymakers enjoyed beautiful gardens. "The girls seem to by enjoying themselves here and found themselves a couple of boys last night. We don't even see them at breakfast!" This site is a celebration of Butlins and the Redcoats and staff who worked there. There is a reunion planned for Butlins Redcoats on 23 May 2008 at Billy Butlin's first camp at Skegness.